My palz Mikhail and Luke over at Blogs@Baruch needed an easier way to add users to sites in the WordPress network. They’d been using DDImportUsers, which worked, but was finicky: DDIU required you to specify too much information, its formatting was tough for instructors to understand, and, most importantly, it didn’t deal well with existing accounts, which it simply ignored instead of adding as new users to the site in question. So they asked me to modify the plugin for their purposes. If a WP user is *not* found with the email address in question, SIU creates a new user with that address. The username is automatically generated from the part of the email address before the @-sign, which means that this plugin will probably work best for those setups where you can guarantee unique email prefixes (like schools). Passwords are randomly generated. Then the new user (or the existing user, if one was found) is added to the blog. The user is then sent a customized welcome email. All users get a message saying that they’ve been added to the blog, with information on how to access the dashboard. In the case of new users, it contains their login info as well. If you’re running BuddyPress, the email to new users also contains a message encouraging users to fill out their BP profiles, with a link to the Edit Profile page. The plugin has no settings, and is intended for this very specific purpose. 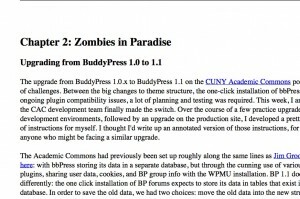 But if you’ve got a setup like Blogs@Baruch, it could save you a lot of time and effort. Get the Simple Import Users here. Date: August 26, 2010 · Author: Boone Gorges. 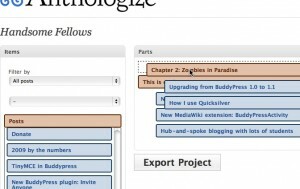 The Anthologize team has been hard at work over the last week, fixing bugs behind some of the most commonly reported problems, and adding features to make Anthologizing easier and more fun. We’ve just tagged version 0.4-alpha in the WordPress repository. 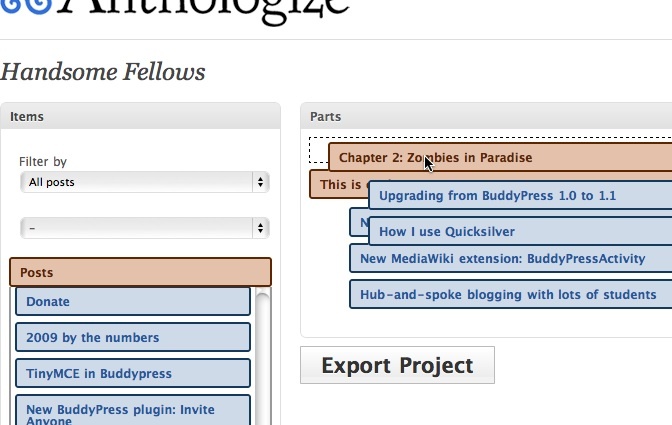 Visit your WordPress Dashboard’s Plugins page to upgrade. Read more about the changes in 0.4-alpha. Questions or thoughts about Anthologize? Visit the Anthologize home page or the Anthologize users group. Date: August 10, 2010 · Author: Boone Gorges.